Synergistic activity of Sulforaphane (Broccozym) and Parthenolide (Butterzym) abolishes cancer stem cell characteristics. Traditional cancer treatments have only focused on the cancer cells, leaving the cancer stem cells behind. Chemotherapy will kill cancer cells, but cancer stem cells may somehow “hide” during chemo or radiation, then later they morph into actively growing cancer cells and move to other parts of the body. If even one cancer stem cell survives, you’re going to have an entire tumor reconstituted, and in a more aggressive form. So in addition to killing cancer cells, cancer treatments must target cancer stem cells to eradicate the disease before they get a chance to initiate new patterns of growth and cause even more problems. If you kill the cancer stem cells, then you eradicate (cure) the cancer. Telomerase is an enzyme in cancer stem cells that keeps these cells immortal by keeping telomeres at the end of our DNA strands long. Telomeres at the ends of chromosomes are long in youth, but shorten with each division of the cells (aging process). Telomerase keep the telomeres in cancer stem cells long, so the cell becomes immortal. Inhibiting telomerase causes the telomeres to shorten and the cancer stem cells are killed off. Forcing tumor stem cells to an end. Sulforaphane, a natural component of broccoli and other brassica vegetables, has histone deacetylase (HDAC) inhibition activity and exciting potential for cancer treatment. Sulforaphane reduces the growth of cancer stem cells and impairs their viability. Sulforaphane inhibits telomerase activity via downregulation of telomerase reverse transcriptase (hTERT) expression. Sulforaphane decreases viability and telomerase activity in hepatocellular carcinoma Hep3B cells through the reactive oxygen species-dependent pathway. Sulforaphane causes epigenetic repression of hTERT expression in human breast cancer cell lines. The Wnt, Hedgehog and Notch signalling pathways have been known to direct growth and patterning during embryonic development. Recent evidence also implicates these pathways in the postembryonic regulation of stem-cell number in epithelia such as those of the skin and intestine, which undergo constant renewal. 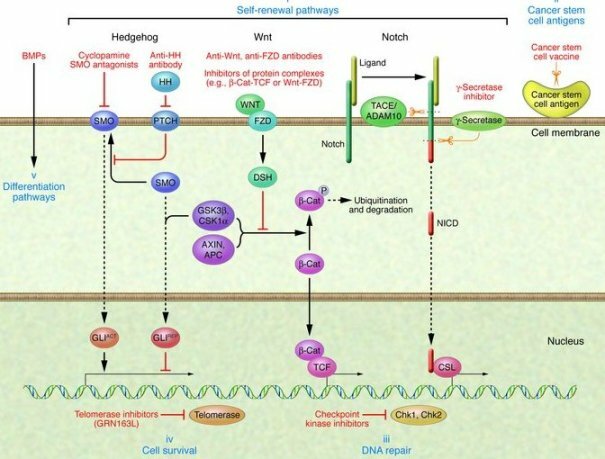 A pathological role for the Wnt, Hedgehog and Notch pathways has emerged from studies showing a high frequency of specific human cancers associated with mutations that constitutively activate the transcriptional response of these pathways. The Wnt signaling pathway has been implicated in a wide range of biological processes from maintaining the pluripotentiality of stem cells to the induction of specific tissues and organs during development. Stemness of cancer cells is in part orchestrated by the microenvironment and is a much more dynamic quality than previously expected that can be defined by high Wnt activity. The Wnt pathway is believed to be a key target in halting cancer stem cell activity. Sulforaphane downregulates the Wnt/beta-catenin self-renewal pathway and inhibits cancer stem cells. Controversies in cancer stem cells: targeting embryonic signaling pathways. The various roles of ubiquitin in Wnt pathway regulation. A Wnt-ow of opportunity: targeting the Wnt/beta-catenin pathway in breast cancer. It has been known that there is a crosstalk between Akt and Wnt signaling pathways through the signal communication between GSK-3β and β-catenin, two of the important molecules in Akt and Wnt pathways. Because sulforaphane inhibits the activation of Akt, it could also inhibit Wnt activation through the crosstalk between Akt and Wnt signaling. DIM (Di-Indolyl Methane) is a dietary indole found in cruciferous vegetables (cabbage, broccoli, etc). DIM is a direct digestive metabolite of I3C (indole-3-carbinol). DIM also inhibits the activation of Akt. Indeed, DIM significantly increased the phosphorylation of β-catenin and inhibited β-catenin nuclear translocation, suggesting that DIM could also down-regulate the activation of Wnt signaling. Inhibition of Akt inhibits growth of glioblastoma and glioblastoma stem-like cells. Antiproliferative activity of sulforaphane in Akt-overexpressing ovarian cancer cells. Sulforaphane sensitizes tumor necrosis factor-related apoptosis-inducing ligand-mediated apoptosis through downregulation of ERK and Akt in lung adenocarcinoma A549 cells. Role of PI3K/Akt and MEK/ERK signaling pathways in sulforaphane- and erucin-induced phase II enzymes and MRP2 transcription, G2/M arrest and cell death in Caco-2 cells. Regulation of FOXO3a/beta-catenin/GSK-3beta signaling by 3,3′-diindolylmethane contributes to inhibition of cell proliferation and induction of apoptosis in prostate cancer cells. Curcumin also showed its inhibitory effects on Wnt signaling. Study has shown that curcumin suppressed β-catenin response transcription activated by Wnt3a and inhibited the growth of various colon cancer cells. It has been found that curcumin induced caspase-3-mediated degradation of β-catenin, leading to the decreased binding of β-catenin to TCF and the inactivation of Wnt signaling. Curcumin also downregulates p300 which is a positive regulator of the Wnt/β-catenin pathway. Gene expression profile analysis also showed that the expression of Frizzled-1 (Wnt receptor) was most strongly attenuated by curcumin. Beta-catenin-mediated transactivation and cell-cell adhesion pathways are important in curcumin (diferuylmethane)-induced growth arrest and apoptosis in colon cancer cells. Gene expression profiling identifies activating transcription factor 3 as a novel contributor to the proapoptotic effect of curcumin. The role of Hedgehog signalling in embryonic pattern formation is well established. Hedgehog signalling is essential for maintenance of cancer stem cells. A recent study shows that combined targeting of histone deacetylases (HDAC) and hedgehog signaling enhances cytoxicity in cancer cells. Sulforaphane acts as a powerful HDAC inhibitor in human cancer cells. Betulinic acid is a naturally occurring pentacyclic triterpenoid which has anti-retroviral and anti-inflammatory properties, as well as a more recently discovered potential as an anticancer agent, by inhibition of Hedgehog signalling. It is found in the bark of several species of plants, principally the white birch (Betula pubescens) from which it gets its name. Furthermore, Betulinic acid induces apoptosis through a direct effect on mitochondria in cancer cells. Hedgehog beyond medulloblastoma and basal cell carcinoma. Combined targeting of histone deacetylases and hedgehog signaling enhances cytoxicity in pancreatic cancer. Dietary sulforaphane, a histone deacetylase inhibitor for cancer prevention. Modulation of histone deacetylase activity by dietary isothiocyanates and allyl sulfides: studies with sulforaphane and garlic organosulfur compounds. The dietary histone deacetylase inhibitor sulforaphane induces human beta-defensin-2 in intestinal epithelial cells. Sulforaphane inhibits histone deacetylase in vivo and suppresses tumorigenesis in Apc-minus mice. The role of tumor initiating cells in drug resistance of breast cancer: Implications for future therapeutic approaches. 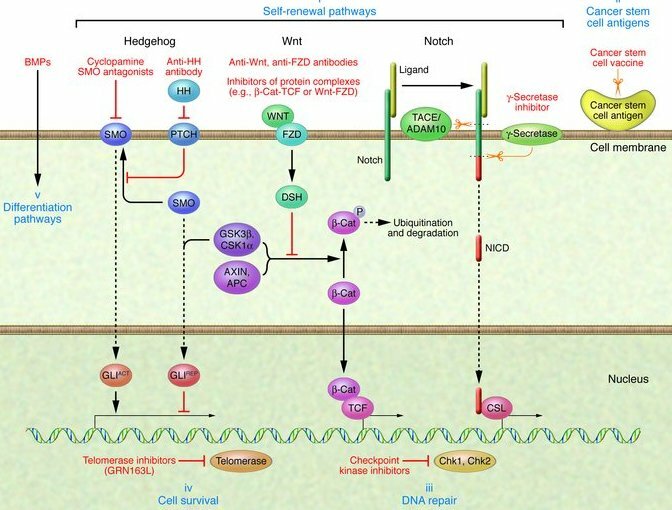 Modulators of the hedgehog signaling pathway. Betulinic acid induces apoptosis and inhibits hedgehog signalling in rhabdomyosarcoma. Betulinic acid treatment promotes apoptosis in hepatoblastoma cells. Betulinic acid induces cytochrome c release and apoptosis in a Bax/Bak-independent, permeability transition pore dependent fashion. The Notch signaling pathway is involved in cell fate decisions throughout normal development and in stem cell proliferation and maintenance. In cancer cells, Notch signaling is abnormally activated, leading to the increased proliferation of cancer cells and the epithelial to mesenchymal transition. The role of Notch in cancer is now firmly established, and recent data implicate a role for Notch signaling also in cancer stem cells. Genistein also interferes with Notch signaling, a pathway which also increases AKT and NF-kappaB signaling. Targeting Notch to target cancer stem cells. HER-2, notch, and breast cancer stem cells: targeting an axis of evil. Sulforaphane Increases Drug-mediated Cytotoxicity Toward Cancer Stem-like Cells of Pancreas and Prostate. Inhibition of nuclear factor kappab activity by genistein is mediated via Notch-1 signaling pathway in pancreatic cancer cells. The ability of sulforaphane to induce apoptosis and cell cycle arrest is associated with regulation of many molecules including Bcl-2 family proteins, caspases, p21, cyclins, and cyclin dependent kinases. Sulforaphane was also shown to suppress angiogenesis and metastasis by downregulating vascular endothelial growth factor, HIF-1α, matrix metalloproteinase-2 and matrix metalloproteinase-9. Unfortunately dietary broccoli extracts in supplement form didn’t help cancer patients due to very low content of sulforaphane. Moreover, there are several pharmacokinetic studies about sulforaphane’s extremely low solubility and bioavailability, which means that most of what we swallow goes directly into our gastrointestinal area and is expelled. Bioactive BroccoZym, providing 14% sulforaphane glucosinolates, perfectly improve the cellular uptake of sulforaphane, the healthful extract from fresh organic broccoli seeds and sprouts, with clinically validated efficacy in for helping cancer patients. It is recognized that the therapeutic effectiveness of sulforaphane is limited due to its poor absorption from the GI tract, so the use of the natural fermentation to enhance its uptake is particularly beneficial. Parthenolide (ButturZym) also triggers cancer stem cell-specific apoptosis and as such represents a potentially important new class of drugs for cancer stem cell-targeted therapy. Parthenolide can kill cancer stem cells and not normal cells. Parthenolide (ButturZym) is the only agent with established clinical efficacy in treating human cancer and leukemia and has been used alone and in combination with sulforaphane (BroccoZym), curcumin (CurcuZym), genistein (GenisZym) and betulinic acid to successfully treat cancer and leukemia. We were able to show that sulforaphane (BroccoZym) had additive or synergistic activity with parthenolide (ButturZym) against cancer and leukemia. The missing link or Holy Grail to curing cancer is the cancer stem cell. Synergistic activity of sulforaphane (BroccoZym) and parthenolide (ButturZym) abolishes cancer stem cell characteristics. Eradicate it and may get cures.